Starz Horror-Comedy Series To Kick Ash For Second Season! We’re still three days and a bit out from the series premiere of Ash vs. Evil Dead but Starz has seen fit to give the series a second season order today. The early renewal comes as rave reviews from sources like Deadline.com, TV Guide and IGN pour in. Ash vs. Evil premieres on October 31st (Happy Halloween!) – simultaneously around the globe. For details, follow the jump. Beverly Hills, Calif., October 28, 2015 – Ahead of its Halloween premiere, STARZ Original series “Ash vs Evil Dead” has earned an early renewal for a second season from Starz. 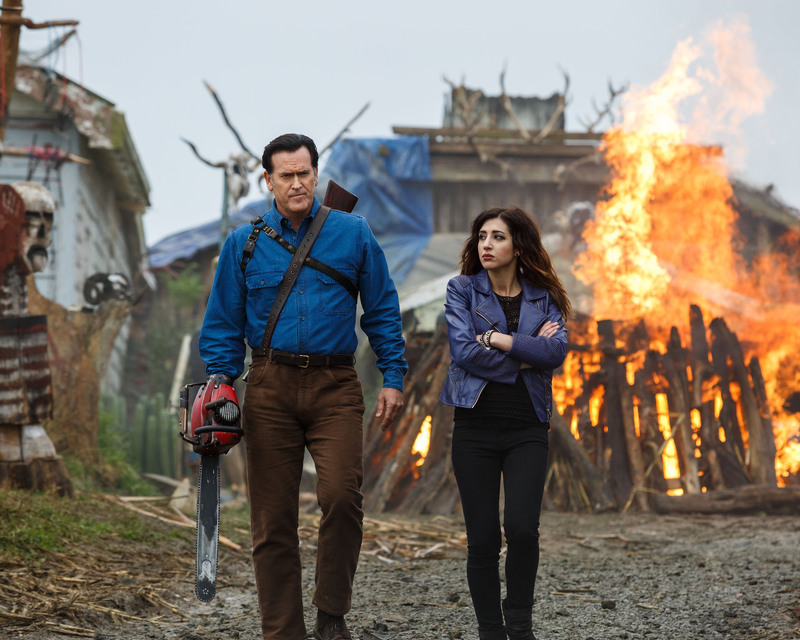 Strong fan, affiliate and distributor demand for the highly-anticipated premiere of “Ash vs Evil Dead” has generated the early pickup of the series which is the long-awaited follow-up to the classic horror film The Evil Dead. Executive producers and The Evil Dead original filmmakers Sam Raimi, Rob Tapert and Bruce Campbell will return for the second season with executive producer and showrunner Craig DiGregorio. Campbell will continue in his role as Ash Williams, the aging lothario and chainsaw-handed monster hunter. Lucy Lawless (“Salem,” “Spartacus”) is also returning as Ruby, a mysterious figure who believes Ash is the cause of the Evil outbreaks. Starz recently announced global licensing deals with broadcasters and digital platforms in more than 100 countries and territories worldwide allowing “Ash vs Evil Dead” to premiere simultaneously with its network premiere in the U.S. on October 31. Broadcasters and digital providers offering “Ash vs Evil Dead” on October 31 include Amedia (Russia/CIS), C More (Scandinavia), Fox Action on Fox+ Premium service/Fox Latin America Channels (Latin America/Brazil), Sky TV (New Zealand), Stan (Australia), Starz Play Arabia (Middle East/North Africa) and Super Channel (Canada). Starz will retain all domestic and international multiplatform rights including television, home entertainment and digital. The 10-episode first season of the half-hour series features Bruce Campbell (Evil Dead, “Burn Notice”) as Ash Williams; Lucy Lawless (“Salem,” “Spartacus”) as Ruby a mysterious figure who believes Ash is the cause of the Evil outbreaks; Ray Santiago (“Touch,” Meet the Fockers) as Pablo Simon Bolivar, an idealistic immigrant who becomes Ash’s loyal sidekick; Dana DeLorenzo (A Very Harold & Kumar 3D Christmas) as Kelly Maxwell, a moody wild child trying to outrun her past; and Jill Marie Jones (“Sleepy Hollow”) as Amanda Fisher, a disgraced Michigan State Trooper set to find our anti-hero Ash and prove his responsibility in the grisly murder of her partner. Previous PostAbsurd Trailer: The Ridiculous 6!Next PostNBC Hits The Wall With New Game Show!